Symbolism was the memorable part of the just-concluded Arab summit in Doha. 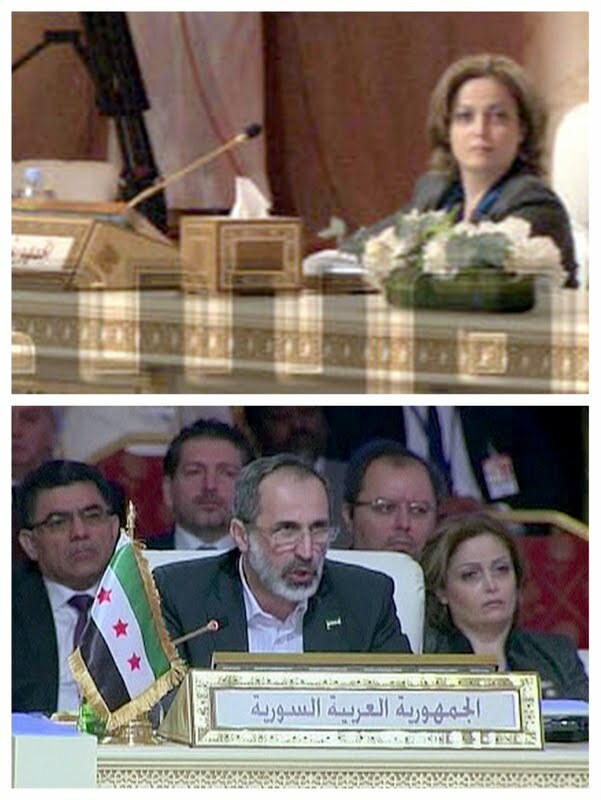 The symbolism of Syrian opposition leader Moaz al-Khatib being asked to take over President Bashar al-Assad’s seat and address the Arab heads of state in the name of the Syrian people. And the symbolism of Suhair Atassi briefly deputizing for Khatib later and becoming the first Arab woman to chair an Arab League summit delegation. Seeing the Syrian opposition delegation meet huge applause as it made its way to its country’s seat at the summit was unusual. Witnessing Moaz al-Khatib seated behind the revolution flag, instead of the decades-old Syrian Republic flag we knew, was extraordinary. Seeing no walkout from the conference room by any delegation leader was equally remarkable. It is not in the habit of Arab summits to send that sort of message to a member-state’s regime. The Doha summit did not suffice with keeping Syria’s seat vacant but went further and gave it to a delegation representing the Syrian revolution. The remarkable thing is that the image pertains to an Arab League heavyweight and founding member-state that used to have the last word on matters concerning Lebanon and Palestine. The image carried a few connotations. It was a sharp response to Lakhdar Brahimi’s last visit to Damascus. It evoked the unimaginable human and material losses inflicting by the regime’s military machine on cities and villages and their residents. And it recalled Russia and Iran’s persistent backing of the regime at the risk of triggering regional and international face-offs liable to dismember or destroy what remains of Syria. The image came in the context of a growing belief among Arab and Western decision-makers that the Syrian regime will turn down any political settlement unless forced. This explains the (summit) resolve to redress the balance of forces in favor of the revolution. The resolve translates into resuming the funding and arming of opposition forces and continuing to de-legitimize the regime. That’s what can be read into yesterday’s image. The image came as the Free Syrian Army (FSA) was launching increasingly audacious attacks on regime forces in the country’s south, thus knocking at the door of the regime’s capital, and shelling the heart of Damascus almost daily. What did the other sides read into yesterday’s image? We have to wait and see what Damascus infers from Khatib heading the Syria delegation to the summit. Does Damascus have options other than the one it is using? What will Tehran deduce from the image coming, as it did, when the Saudis were saying they had arrested a spy ring linked to Iran’s intelligence services? Will it perceive the image as a relentless drive to root out its position in Syria and block its route to Lebanon? Will it deduce that retreat or a change of course is behind time? And what is Hezbollah reading into the image? Does it feel Lebanon can take more meddling by its men in the Syria fighting? What does Nouri al-Maliki notice in the image after choosing to watch it from Baghdad? And what will Moscow detect in the image after Khatib said the opposition is looking forward to claim Syria’s seat at the United Nations and other international organizations? Another warranted question is: How will the Syrian opposition build on yesterday’s success? Will it be tempted to go for the kill and try a knockout against the regime? Or will it choose to redress the balance on the ground and keep alive the chance of Syria’s components continuing to coexist? And will the revolution amplify yesterday’s achievement by closing ranks, ending internal splits and shutting out roving fighters? Syria watchers are seriously worried lest the next image turns out to be bleaker than the one that preceded yesterday’s. Some of them are anticipating a terrible and ruinous battle in Damascus that would set off a new wave of refugees and rivers of blood and funerals. They say what we’ve seen so far, which is terrible, is only a small sample of what’s in store. That will most likely be the case. The Syrian revolution has entered its most difficult and dangerous phase. The neighboring countries are buckling up in expectation of the tremor. In face of the pending horrors, the adversaries would be well-advised to keep the phone numbers of Lakhdar Brahimi handy. They might need him to certify the change and check the losses and outrages.